Crema Para El Eczema Tratamiento Hidratante Piel Seca Irritada Comezón Packaging May VaryNatural colloidal oatmeal relieves dry, itchy, irritated skin due to eczemaInstantly calms skin with a mild cooling sensation due to eczemaCeramide fortified formula improves skin conditionLicochalcone enriched formula soothes and improves the appearance of red irritated skin Eucerin Eczema Relief Flare-Up TreatMent 2 Ounce Colloidal Oatmeal cream protects and helps relieve minor skin irritation and itching due to eczema flare-ups. This unique skin protectant formula instantly calms and soothes, and relieves minor skin irritations and itching due to eczema flare-ups. 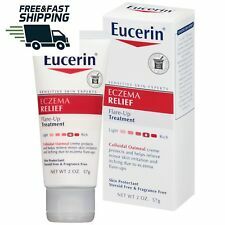 Eucerin Skin Science that Shows For over 100 years, Eucerin has pioneered skincare innovation, and today we are recognized and trusted by dermat. Instantly calms skin with a mild cooling sensation due to eczema. Trending at C $11.39eBay determines this price through a machine-learned model of the product's sale prices within the last 90 days.